David Beattie’s art is situated between the scientific, the human and the spiritual. His sculptures combine sound, movement and physics to create unlikely alliances. His reapplication of domestic objects and technologies offers a fresh take of their function and allows a reinterpretation of these outmoded objects. David is an artist who is deeply interested in concepts around materialism and object-orientated philosophy spear-headed by Heidegger and Graham Harman. ”The impossibility of an Island” continues his interest in the physicality of sound and how we experience sound in our everyday. It is also informed by recent philosophical writing known as Object Oriented Ontology. It explores the idea of objects existing independently of human perception, and is not ontologically exhausted by their relations with humans or other objects. 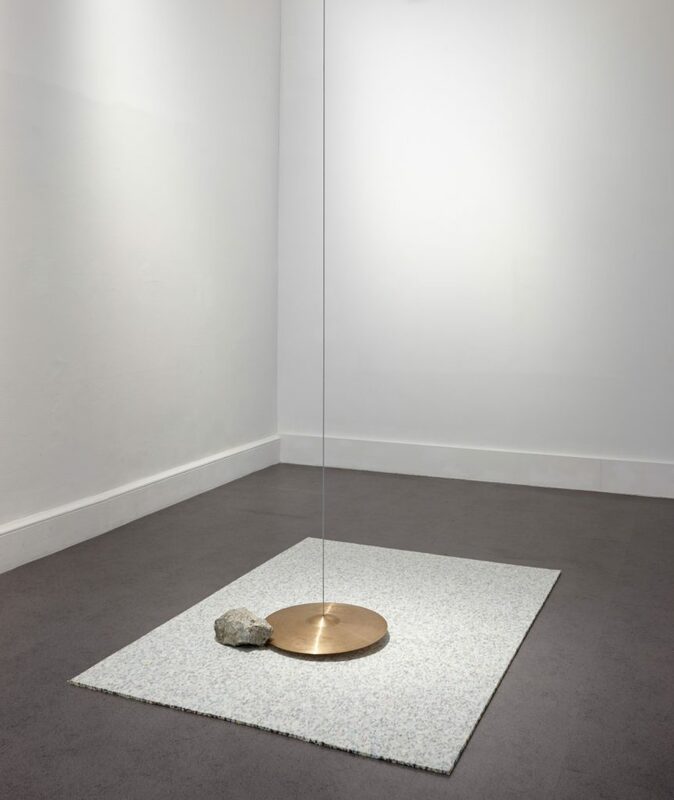 Consisting of a piece of used broken concrete, carpet underlay and a used cymbal, the object interrelations are explored through their materiality. The underlay cushions the concrete as well as absorbing some of the sound produced. The rock although static and non active is essential in activating the sound produced as the cymbal rotates and rubs of the rock. The variations in the concrete structure mean that the position of touching the cymbal varies constantly and in turn creates a variation in the sound output. In many of his works he employs rotation to create cycles and loops of constant present, and as part of this I often create a slight disturbance to offer a reminder of imperfection and avoid complete repetition. Some of David’s recent solo exhibitions include, A Knowledge of Things Familiar, Temple Bar Gallery and Studios, Contemporaries Guest Room at the Collective Gallery, Edinburgh, Old Light, New Darkness at The Mattress Factory Art Museum, Pittsburgh and The Weight of the Sky at the Mercer Union Centre for Contemporary Art, Toronto. Copyright © David Beattie | Denis Mortell photography.